How do I solve a kakuro? Check out the tutorial if you need further details. How do the daily puzzles work? Every day there is a new kakuro made available to be solved. They vary in size and difficulty from day to day, and are guaranteed to be uniquely solvable. Mondays and Tuesdays are size 10x10, Wednesday through Friday are size 13x13, and the weekend puzzles are 24x14. You need to be logged in to solve the daily puzzles. If you don't want to have the hassle of an account, you can use the generator instead, though the puzzles it generates aren't as refined as the daily ones. I started a puzzle and it says I've taken several hours? You probably started the puzzle and didn't complete it. The timer does not stop on the daily puzzle until you have solved the puzzle, no matter if you're on the site or not. If you want to avoid this problem, try to only start the day's puzzle when you have a little time to spare. With the archived puzzles this is not a problem, as you get a new timer every time you start a new puzzle, and it stops when the puzzle is not open. Why doesn't the time on the leaderboard match the time I got? The times on the leaderboard are calculated from the database. The timer you see while solving the puzzle is close to the database time, but can be off by a second or two, due to rounding errors. I completed a puzzle, why am I not on the leaderboard for it? You can only get on the leaderboard for a day's puzzle if you complete it on the day it was made available. If you solve the day's puzzle multiple times on that day, only the first time counts. How does saving a puzzle work? Clicking the "Save" button on the puzzle screen will save your current progress on the puzzle. The border of the message area will turn green if it is successful. You can then return to the puzzle at the point you left it by playing that puzzle again. If you're doing a daily puzzle the timer will continue to run until you solve it. On an archived puzzle it will save your time as well as the solution. It says I've been banned? You can get banned for misconduct on the forum, or for cheating on the daily puzzles. Please don't cheat on the daily puzzles, I know when you're doing it. To start putting in a solution, first, left-click on the cell you want to solve. It should turn blue. You can then either type a number with your keyboard, or click one of the numbers buttons in the row above the puzzle. If you think you made a mistake you can hit the spacebar or the delete key, or click the empty button in the top row. Once you think you've got the cell correct, you can click on another cell or use the arrow keys to move the active cell around. You can click on a clue to show the possible combinations of numbers for it. If you're using the arrow keys to move around the puzzle, you can move the active cell onto the clue and hit A(across) or D(down) to show the combinations. On harder puzzles it may be necessary to input "candidates", or values that the cell could possibly be, to aid solving. To start entering in candidates, you can right-click the desired cell, or left-click it and hit a shift key. The cell should turn green. You can then enter any combination of the nine numbers into it. If you want to remove a candidate already entered, just hit the button or key of the number you want removed. Hitting the shift key with a cell highlighted will switch between candidate and normal mode. Hitting C while in candidate mode will copy the candidates of the active cell, which can then be pasted in other cells with V.
The "Submit" (or "Check" on the generator page) button will verify that your solution is correct. If there are incorrect parts of the puzzle, it will change the border of the puzzle to red and highlight the clues of the rows or columns with errors. If your solution is correct, the border of the puzzle will turn green. On a generated puzzle nothing more happens; on a daily puzzle or archive puzzle it will save your time in the database. The clear button clears the entire puzzle. Unless you have saved, there is no getting your work back after that, so be careful! How do I print a puzzle? There's a print button on the generator page which will open the puzzle in a new tab. You can then print it off from there, though I recommend setting it to grayscale first. 15 width and 20 height is a good size for standard size paper. Why can't I use the generator? Why did the progress bar reset? If the puzzle it was generating seemed to be taking too long it will restart. The most common cause is grids that are too wide open to be made into a valid kakuro. This wall happen most often on the hard difficulty setting, where the grids are the sparsest. Why was that medium puzzle way easier than the easy one I just did? The difficulty settings limit the type of solving logic that is used while generating. The easy setting only uses the simplest deductions, and medium and hard add more logic. Thus it is possible that a "hard" puzzle will end up being solvable using only the "easy" logic. In the interest of saving time I don't regenerate if that happens. How do I save my progress on a generated puzzle? You can hit the appropriately labeled "Save" button. You can then hit the "Load" button at any time to return where you left off. Saving a generated puzzle will overwrite any previously saved generated puzzle. Note that the save functionality on the generator page is specific to the device it is saved on. Even if you are logged you will not be able to continue your puzzle on another device. How do I load a specific puzzle? You can type in a puzzle ID in the text box labeled "puzzle ID", and hit the "Generate Puzzle" button. Why can't I use the solver? How do I input a puzzle? 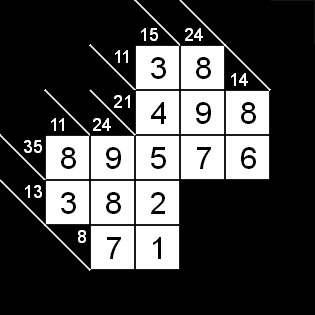 The first step is to enter in the width and height of the puzzle you want solved and click the "Display Grid" button. You can then start putting in the clear cells of the puzzle. Once you're done with those, you can input the clues of the puzzle. I like to put all the so-called "diagonal walls" first, and then use the tab key to cycle through them as I input the clues themselves. If you run out of room, you can click the "Add Column" or "Add Row" buttons to give yourself more room. Once you think you've got it right, you can click the solve button. If you have empty cells abutting the right or bottom edges, it will fill in walls to totally enclose the puzzle. It will helpfully tell you if you have any invalid sections of the puzzle. Normally that there are numbers inputted without a clear cell directly adjacent. Or that there is a series of open cells without a clue at the top or left. The exception is that you are allowed to have a series 1-cell long that has no clue. There are a couple reasons that that could be the case. The first and most likely is that you inputted the puzzle incorrectly. It can be hard to tell where the error might be, since all the numbers around the erroneous clue could be solved. The second is that your puzzle doesn't have a unique solution. If your puzzle almost solved except for a few connected blank cells this is a likely reason. The third is that your puzzle is just too hard. Sorry about that! The most likely case is that you inputted the puzzle incorrectly. One of the problems with the solver is that it assumes that any puzzle it is given has a valid solution, so it can get a little goofy with invalid puzzles. Recheck the puzzle you entered and you will probably find a 19 that should be an 18 or something similar.